Republished by NeWGS in 2006; 152 pages, including an-all name index and 78 photos. 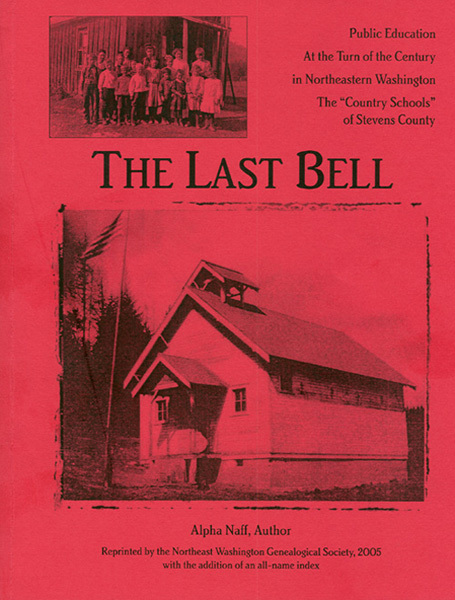 This book details the history of the early schools in Stevens County. "When Moses Dupuis, superintendent of Schools in Stevens County, divided the county into school districts in 1875, there were but 5 public one-room schools; this number had increased to 107 by 1893." Information is included on all of these schools with lots of families are mentioned. The Table of Contents lists the following specific areas: Addy, Aladdin Road, Basin, Blue Creek, Cedar Creek-Boundary, Cedonia-Hunters, Chewelah, Chewelah Creek, Clayton, Colville, Cottonwood Creek, Daisy-Gifford, Deep Creek, Echo Valley, Eells Academy, Flat Creek, Enterprise, Ford-Tum Tum, Fruitland, Loon Lake, Marcus, Meyers Falls, Mill Creek (Forks), Northport, Old Kettle Falls, Onion Creek, Orient Region, Orin, Rice, Sheep Creek, Springdale, Summit Valley, Tiger Highway, Twelve Mile-Arden, Valley, and Williams Valley.